Illegal Aliens: A couple of decades too late to the party. Co-writer/director Neill Blomkamp sets District 9’s pivotal event—the arrival of a derelict alien spacecraft over Johannesburg, leaving a million extraterrestrial refugees—in the 1980s. Apparently, that’s when the filmmaker learned everything he needed to know about allegorical science fiction. Twenty years after the aliens’ arrival a heavily patrolled slum has sprung up around the hovering mothership, and the creatures—called “Prawns” for their arthropod-like appearance—have become the object of hostile native sentiment. Casually racist bureaucrat Wikus (Sharlto Copley) gets the task of overseeing a mass relocation of the Prawns farther away from the city, but a run-in with an alien liquid leaves him facing a particularly ironic transformation. Yes, South African cinema is attempting the metaphor route to purge its apartheid guilt, while also providing a convenient counterpart for Americans as we confront our feelings about unwanted immigrants. Blomkamp serves up clunky analogues for real problems of segregation—e.g. the Prawns getting high on cat food—and hopes you’re either sympathetic enough to the themes not to care, or too wrapped up in the exploding bodies to notice. 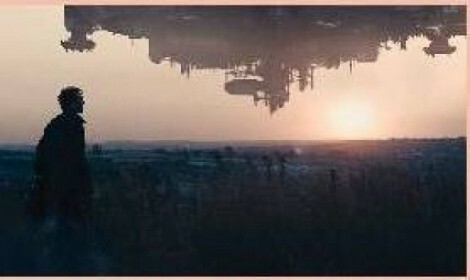 But, what’s most disappointing about District 9 is how familiar it all is, provided you look back a generation. The alien-as-target-of-racism angle was covered by 1988’s Alien Nation; Wikus’ fate looks remarkably similar to that of Jeff Goldblum in 1986’s The Fly. Throw in nods to Aliens and RoboCop and clearly Blomkamp did his homework, re-watching the best of that era. Which is different from re-creating it. Employing that popular device of the fake-documentary/found footage—though only when convenient, it seems—Blomkamp tries to work around the lack of a sympathetic protagonist. Mostly, though, he’s left with as much shooting as he can work into the final hour, providing a moderately entertaining slice of sci-fi action that doesn’t really work as idea-driven drama. In coupling genre pleasures with message-mongering, Blompkamp is just a couple of decades too late to the party.